Three Penn State football players have decided on where they will transfer, and a former assistant coach is heading to Alabama for a lucrative job. Linebacker Jarvis Miller will continue his career at UMass, tight end Danny Dalton at Boston College and linebacker Dae’lun Darien at Delaware. 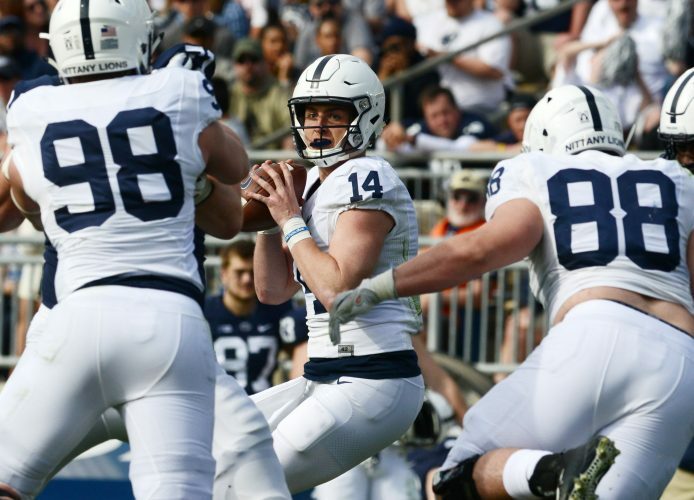 Those three are among 12 Nittany Lions who have been considering a transfer, which is believed to be the highest number of any major-college program. Miller already has his degree, so he will be able to play at UMass next season as a grad transfer. The same goes for Dalton, so he will be eligible next season at Boston College. Darien is transferring down a level to the FCS, so he will not have to sit out a year and can play next season. Former PSU running backs coach and special teams coordinator Charles Huff has been hired as Alabama’s new running backs coach. Some stories out of Alabama have suggested Huff also will become co-offensive coordinator for the Crimson Tide, making it a big move in his career. Huff left Penn State a year ago to join Joe Moorhead’s staff at Mississippi State. Hufff confirmed his move to Alabama in a tweet. Former Penn State assistant Josh Gattis was Alabama’s co-offensive coordinator and wide receivers coach last season, and last week he took the job as Michigan’s offensive coordinator. Penn State has scheduled a non-conference game against UMass for Nov. 11, 2023 at Beaver Stadium. The Lions traditionally have played their non-con games prior to the start of Big Ten play, but that game against UMass will be the third-to-last one of the season.